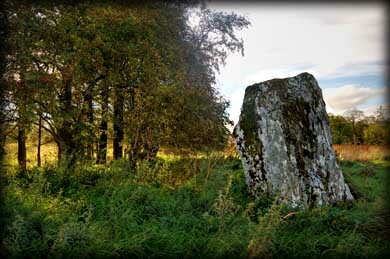 This enormous standing stone is very impressive and can be seen quite clearly from the road. 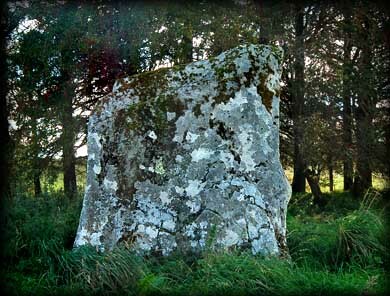 It has also been named as the Ballincool and Mount Druid standing stone on various sites but I am sure this is Kilcorkey townland. Whatever area this stone is in one cannot help but be in awe at its size. This slab-like stone is three metres tall at the northern end sloping to 2.5 metres at the southern end. It is at least 2 1/2 metres in length and about 3/4 metre wide at the base. It is also leaning slightly to the west. This stone stands on the perimeter of the Rathcroghan complex. I had to work with the images as the stone was in the shade at the time of my visit. Situated: From Tulsk take the N6 north to Bellanagare,. Take the first left in the town. Drive for 500 metres. Turn right. The field is in the field on your left . Discovery Map 33: M 745 869. Last visit Sept 2011.